Real Class and Green too! Can one suppose that those who can afford a car priced about four times that of a bread and butter hatch back, that they achieved that position by sage savings on their motoring costs? I very much doubt that that is the case, more likely the cash flow allows for hefty running costs. Can one also suppose that owners of serious off-road 4x4 and Sport Utility Vehicles buy them because they can’t get home without traversing a bog or a mountain? Judging by the numbers of this type of vehicle that are certainly squeaky clean and often shod with low profile tyres, I don’t think that the majority have got closer to the rough stuff than a blade of grass at the side of suburban pavement. Thank goodness then that it is more or less a free world, at least when it comes to choice providing one has the finances, and the modern motorcar is one way to make a statement. 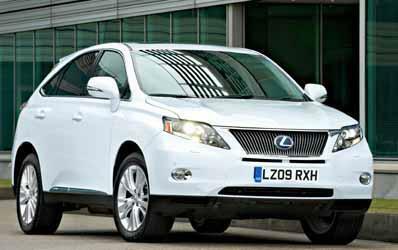 A certain Lexus model has provoked these thoughts, namely the Lexus RX 450 Hybrid, a third generation of Lexus’ 4x4 model range that originally started out with conventionally fuelled power units but has now gone all petrol hybrid on the UK market. Yes it is a luxury class vehicle as one would expect from Lexus, a work of art, an engineering exercise of the highest quality and certainly a vehicle that makes a very positive statement. The image is that of a high class 4x4 or SUV though its purpose is that of an exceptionally refined road vehicle that is intended to be spotted in the best parking places like the Captain’s hallowed spot at the golf club or next to the front entrance of a luxury 5-star hotel. The fact that this Lexus employs a sensibly sized 3.5 litre V6 petrol engine, plus two electric motors, one at the front and a smaller one at the back to give a bit of power to the rear wheels permits it to prune its carbon footprint to an acceptable 148 g/km, a figure more akin to a small family vehicle than that of a commanding one touching scales around a couple of tons. Depending on the owner’s income, this Lexus could produce serious savings in running costs and taxes of around £4,000 a year that could be spent on more worthwhile pursuits – golf perhaps? Primarily this Lexus brings a very easy and comfortable driving lifestyle with exceptionally light controls, good handling, generally a good ride though even with its air suspension it can remind one of the local Highways Department’s shortcomings but above all a mode of refined and cosseted travel that conventionally powered 4x4 contenders, regardless of cost, cannot even get near to emulating. Sit in the generously proportioned leather upholstered driving seat, use the electronic controls to adjust the seat to your liking and the power adjustable steering wheel to ensure that you are fully relaxed and then take stock of where your money has gone. In this market sector Lexus has not sold you short. The rear view camera even has a good coverage of what is at the side and is aided by audible proximity sensors, the cruise control has a radar operated system that automatically slows the vehicle, there are memory settings for the powered front seats, the camera screen also doubles for the satellite navigation, the large exterior mirrors automatically fold and the climate control air conditioning system has a split distribution function though if real fresh air is required there is a powered sunroof. A Mark Levison Premium Sound System at least enables one to compensate for the eerie silence of this Lexus! Yes, you can sneak off at any God forsaken time without waking the neighbours, providing a light throttle foot is employed the electric power will provide up to 30 mph before the petrol engine comes to life and with a greater demand for performance the second electric motor will come into play. Any lift off means that surplus energy through braking recharges the batteries, so there is never any need to fiddle around with a charger plug at a lamp post! Driven wisely it is possible to see a consumption rivalling a medium sized car, say between 32 and 40 mpg while being able to reach 60 mph from rest in well under 7 seconds and, according to Lexus, a top speed of 124 mph. What soon becomes evident is that this large Lexus is far from clumsy, it is easy on the driver, never challenging like some 4x4s I have encountered, a sophisticated drive with a high feel good factor that combine to ensure a good long distance cruiser and not in any way an off roader, so don’t stray off the straight and narrow. Practical? Measure the load space with all five generous and comfortable seats in use and at least two of you could have a round of golf but not much luggage. The 60/40 split fold rear seat facility obviously adds to the load permutation but this sleek prestigious machine is not cluttered by roof rails. That would be a bit common! So for those with the fitting financial qualifications, looking for one of the most refined drives in a commanding vehicle that has cleverly been contrived to avoid accusations of flaunting one’s credit rating, though with a technical CV that can induce a small degree of smugness, then the Lexus RX 450H could be suitable. Price range: From £52,435 – as tested £53,390. LAND ROVER: The production of the one millionth Range Rover will see the car, an £85,000 top specification Vogue version, be auctioned on behalf of the Help for Heroes fund. The first Range Rover was produced in June 1970 and there have been three definitive generations in the model’s 40+ year history. .